13th Nov 2018, New Delhi: Globally, India has become a force to recon with, but the quality of healthcare services provided in the country is still far from being satisfactory. Many private hospitals have come up due to the poor infrastructure in government hospitals, but most of these have become money-making machines. The scenario in the capital of the India is quite unique as many of these private hospitals have taken the benefit of free land and income tax exemptions directly or by acquiring trust run hospitals. To regulate the working of the medical establishments in the city, Delhi Government is rolling out the Delhi Health Bill, which will eradicate the need to implement the Clinical Establishment Act 2010 suggested by the Union Health Ministry. 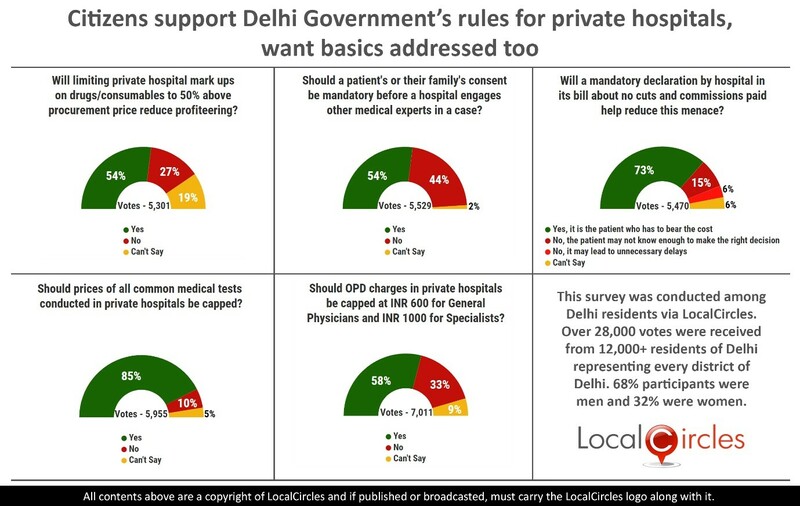 LocalCircles carried out a large survey to check if residents of Delhi were in support of these rules and also checked their views on some other issues pertaining to the working of private hospitals. The survey received more than 28,000 votes from 12,000+ residents of Delhi representing every district of Delhi. 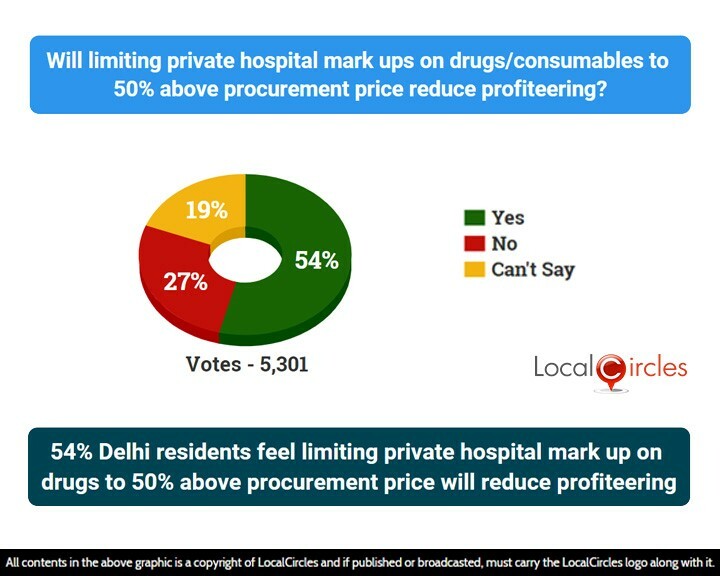 The first question asked if limiting the private hospital mark ups on drugs/consumables to 50% above procurement price reduce profiteering. 54% consumers agreed with it while 27% did not agree with it. 19% were unsure. Cases of patients being overcharged by private hospitals in Delhi have been a common occurrence. Many complaints have been made by patients but at the end of the day, they have to pay what the hospital asks them to pay. The second question asked if a mandatory declaration by hospital in its bill about no cuts and commissions paid help reduce this menace. 54% said yes while 44% said no. 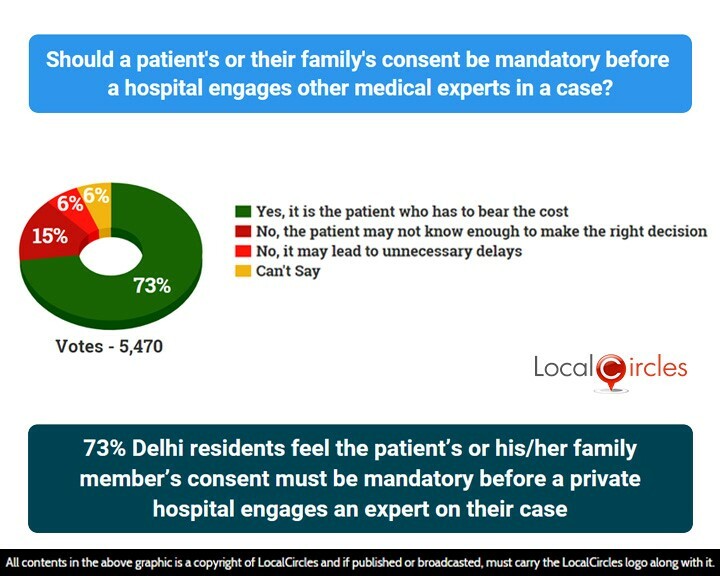 In the third poll, 73% Delhi residents feel the patient’s or his/her family member’s consent must be mandatory before a private hospital engages an expert on their case. 15% felt that the patient may not know enough to make the right decision and 6% felt that it might lead to unnecessary delays. Another 6% were not sure about their choice. Most of the private hospitals engage specialists to treat patients. These specialists are expensive resources and each of their visit is billed at up to Rs. 5000, with multiple visits made every day. Sometimes specialists are involved where they are not even required and without the consent of the patients or their attendants. 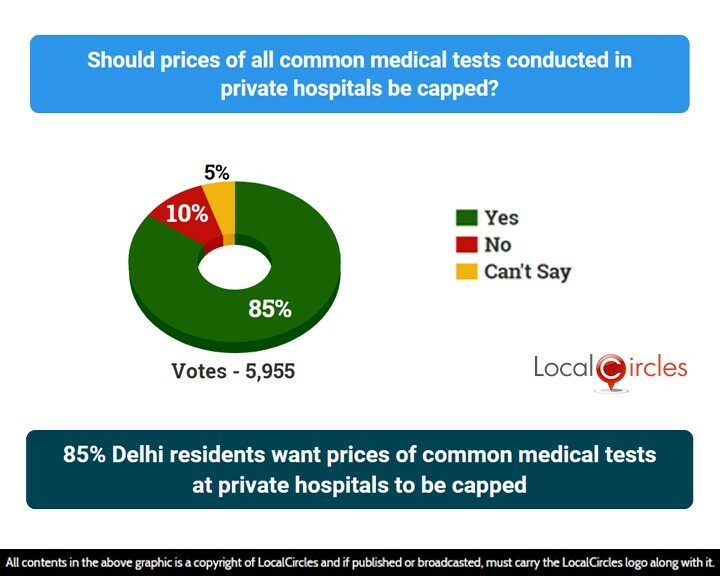 In the next question, 85% Delhi residents said they want prices of common medical tests at private hospitals to be capped. Only 10% thought it was not a good idea. It is an open secret that hospitals advice unnecessary tests to the patients to build up the costs. In the absence of any pricing benchmarks or rules, the hospital is free to charge whatever it wants for the tests it conducts. Many reputed hospitals also charge an ‘express test result fee’ to the patients. 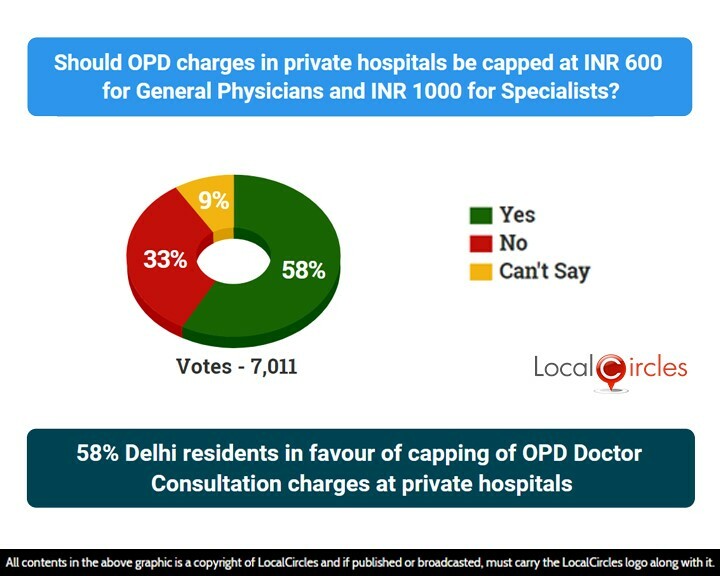 In the last question, when asked if OPD charges in private hospitals should be capped at Rs. 600 for a general physician and Rs. 1000 for a specialist, 58% agreed with it and 33% did not agree with it. Many private hospitals in Delhi charge an exorbitant OPD fees which ranges from Rs. 1000 to Rs. 2000 for every patient. Wanting to consult a good doctor, the patient has no option but to pay the incredibly high fees. The bill also ensures that a patient receives the due emergency attention and is stabilized, before being referred to another hospital. The results of this survey show that the residents of Delhi are in complete support of these rules being created by the Delhi Government, but at the same time want some other basics to be addressed. Making the rules is one thing but enforcing them is another. The intentions of the government seem good in theory and if the rules are enforced properly, patients would be in a much better situation. 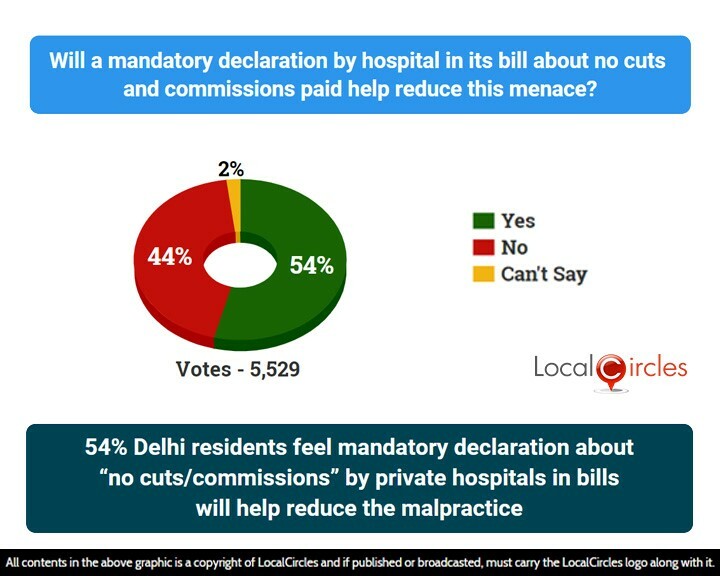 LocalCircles will share the findings of this survey with Chief Minister and Health Minister Delhi Government so the policy can be appropriately amended and implemented.